Angel Gold Corp. (TSX VENTURE:ANG)(OTCQX:ANGCF) ("Angel" or the "Company"), is pleased to provide an update on progress of the geophysical survey program on its Abejero Prospect, the third of the three Prospects tested by the current geophysical program at its El Porvenir project in the Segovia Mining District of Antioquia, Colombia. SHOOT 1, with historic drill intercepts of 5.58m @ 70.35 g/t gold 40.6 g/t silver, and 0.55m @ 14.10 g/t gold 8.90 g/t silver [Foot note(1)] yielded a distinct and discrete chargeability high of around100m in strike length that appears continuous to depth (Figure 2).The indicated 100m strike length of the high-grade shoot and the historic drill-indicated thickness and grades are comparable to results recently reported by Gran Colombia Gold for their Providencia vein (http://www.grancolombiagold.com/news-and-investors/press-releases/press-release-details/2017/Gran-Colombia-Gold-Announces-High-Grade-Drill-Results-From-Its-2016-Infill-Drilling-Campaigns-at-the-Segovia-and-Marmato-Operations/default.aspx). Angel's Abejero vein structure has a similar orientation to Gran Colombia Gold's Providencia Vein, but has a steeper dip. Gran Colombia has traced short strike-length high-grade shoots at their Segovia mining operations down-dip for over 1,300m with these shoots remaining open to depth. 1 The results quoted are for Mineros drill holes RBADDH002 & RBADDH003 respectively. As part of Angel's due diligence program, samples of the assay pulps for both of these drill hole intercepts (the core not being in a suitable state for meaningful re-sampling) were sent to an ISO accredited laboratory along with blanks and standards. There was an excellent comparison between the original and check assays. Angel has no reason to doubt the veracity of the Mineros results. 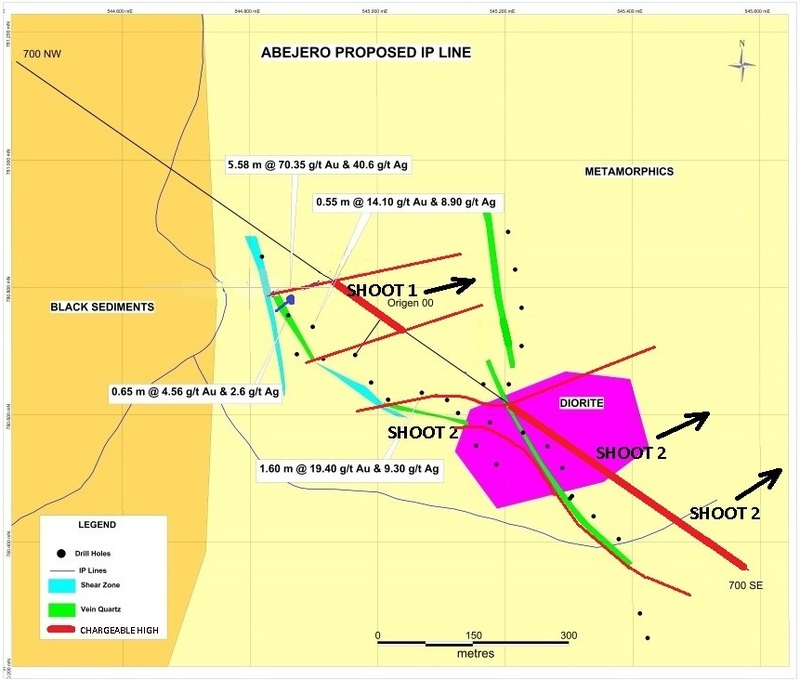 "We are excited that the geophysical survey at the Abejero Prospect coincides with the known mineralization from historic drilling and presents a much larger and stronger conductivity anomaly at the El Porvenir Project. 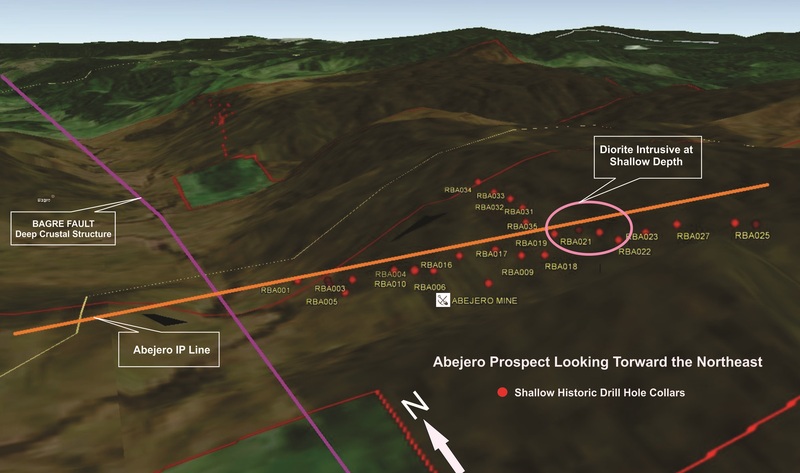 The Induced Polarity geophysics program conducted on El Porvenir has now support the potential for mineralized targets to exist at depth and along strike of known mineralization at all three prospect areas," said Stella Frias, President and CEO of Angel Gold Corp. It is considered likely that the chargeability signature of "SHOOT 2" was actually overprinted and obscured by a stronger signal caused by abundant disseminated, veinlet and breccia-fill sulfide coincident with zones of intense silicification associated with a diorite intrusive body intersected by the shallow historic drilling. In the area, historic drill holes RBA019, 022, 023, and 027 intersected wide zones of intense silica flooding, while drill holes RBA018, 020, 021, 024,025 and 026 intersected more discontinuous patches of intense alteration. Zones of weak disseminated and fracture-fill pyrite to 1%, over intervals of between 5 and 20m of down-hole thickness intersected in drill holes RBA018, 019,020,021,022 and 023 (a strike length of 215m)help to confirm, but not explain, the size and strength of the chargeability anomaly shown in the Induced Polarization geophysical line, which extends more than 400 meters. The extremely brittle intensely silicified rocks encountered by historic drilling, once subjected to and fractured by tectonic forces, can become an excellent host for a breccia-hosted style of mineralization. Similar breccia-hosted mineralization occurs in the intensely silicified intrusive at Angel's Guayabales prospect (http://www.angelgoldcorp.com/2017/03/27/angel-gold-geophysical-survey-encounters-multiple-strong-chargeability-anomalies-at-guayabales-prospect-at-the-el-porvenir-project/) and at Angel's Iguanacito prospect (http://www.angelgoldcorp.com/2017/03/20/angel-gold-geophysical-survey-encounters-strong-chargeability-anomalies-at-the-el-porvenir-project-ground-induced-polarization-and-magnetic-geophysical-surveys-in-progress-at-goldsilver-targets-wi/). Both prospects also occur within Angel's El Porvenir Project and are part of the current geophysical exploration.